When this is over I may write a better write up of the experience, but for tonight, just a taste. In the spirit of Back to the Future day I'm working on my strange looking car's propulsion system. Unfortunately, it's nowhere near as cool as Mr. Fusion. 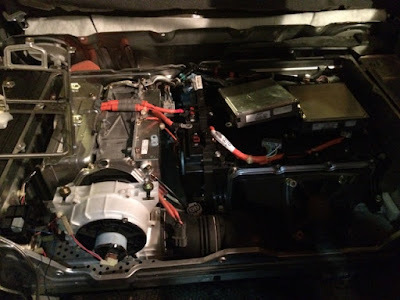 Well I ripped into my 2002 Honda Insight and started to replace the 75 pound hybrid battery. The battery has been bad for a month, and I finally bought the replacement which cost more than I paid for the car. The good news is, I'm learning a lot about Honda engineering. 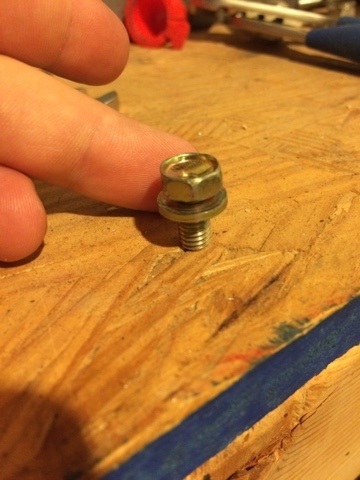 They use what appear to be M4s all with 10 mm hex heads, and these neat washers built on the bolt. Sure I'm sure it must be a little expensive but you can't drop just a washer. Plus, using just the one wrench size is really great. Also, their welding frankly isn't that impressive.